Remember the early days of cell phones, when they were so large and bulky it was like holding a brick up to your ear? Cell phone technology has come a long way since then, but the laws of science don't always cooperate. As a result, you may end up with spotty reception inside your apartment. That doesn't mean you have to resign yourself to the situation. Here are some helpful tips to boost cell reception in your Springs apartment so you can chat or text away to your heart's content. This is the easiest and least expensive option, so it's a good place to start. Areas around windows or the front door are usually the best bet. If the spots are inconvenient, or you don't find any at all, move on to one of the other tips. Placing a call drains a lot of power, which may not leave enough to find a signal. Keep your phone on a charger whenever it's not in use. A cell phone signal booster finds a strong signal in another location, amplifies it and rebroadcasts it for use inside your apartment. Signal boosters are not attached to a specific carrier, so it will work for friends or family who may be visiting. High-gain antennas are available for some cell phone models. These directional antennas can target cellular signals more precisely. For best results, have the antenna replaced at your carrier's retail store. The antennas are relatively inexpensive, but they don't always help. Unlicensed mobile access (UMA) allows a cell phone to use Wi-Fi networks as signals. Call your carrier to find out if your phone supports UMA. Not all phones have the capability, but it's becoming more common with newer models. You may be restricted by your contract, so this is clearly an option of last resort. 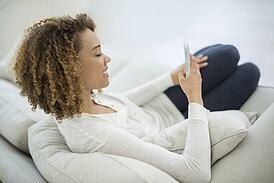 Cell phones are no longer a status symbol for more affluent consumers. Now they are so prevalent that landlines are going the way of VCRs and audio cassettes. Ensuring you have a signal lets you enjoy the convenience that cell phones are intended to provide.